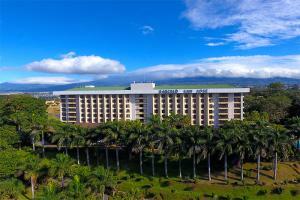 The Barceló San José is situated Costa Rica’s vibrant capital city of San José, within the quiet residential area of Uruca. This recently renovated hotel offers 254 spacious and comfortable rooms, three restaurants, a bar with live music, an outdoor swimming pool, a fitness area, and wonderful views of the city and mountains. Premium Level accommodations offer an elevated experience with private check-in, the best rooms with the spectacular views, priority restaurant reservations, personalized concierge service, and more. The hotel serves as a convenient base from which to explore San Josés attractions La Sabana Metropolitan Park or the National Museum of Costa Rica, or for venturing further to discover the country’s sandy beaches and lush tropical rainforests. Business travelers can take advantage of up to 17 fully equipped meeting rooms and a convention center with a 1,100-person capacity. Situated 15 minutes from international airport and approx. 1 mile from city center. A la carte restaurant, Buffet restaurant, Bar, Cafeteria, Internet Café, Piano Bar. National Museum, The Gold Museum, Museum of Contemporary Art, The Natural Science Museum, National Theatre.